Three years ago I wrote the former Premier and Minister, former MPP Frank Klees, who worked tirelessly to bring oversight and accountability to the Ontario Society for the Prevention of Cruelty to Animals (OSPCA), as well as OSPCA CEO Kate MacDonald. Today I am not including Ms. MacDonald as she refused to respond to my previous communication, a firm indication of just how seriously she takes concerns of animal advocates in Ontario. In my message I outlined a long history of the OSPCA killing animals (note I do not use the term, "euthanizing" as it implies at least a modicum of humanity, the OSPCA has time and again proven itself to be inhumane), outright lying to Ontarians, and refusing to be transparent to both the public and the government. I'm sure you remember back in 2012 when an internal OSPCA memo leaked detailing the need to hide salaries from your government so it could receive additional funding? I wrote with respect of how disenfranchised I was as a voter that the issue of animal welfare in this province has long been determined along party lines. Today while I again write with respect, it is impossible to write without being ashamed. I am ashamed the Ontario government continues to let the OSPCA run amok. I am ashamed it sits idly by and enables an organization to trample over citizens' rights afforded to them under the Charter of Rights and Freedoms. I am ashamed it still refuses to separate the OSPCA's duties of serving as both an animal welfare charity and an Ontario enforcement agency, two duties directly in conflict of each another. I am ashamed it continues to give millions of dollars to an incredibly corrupt organization. I hope you are as ashamed as me. Permit me to offer one current example of how the OSPCA operates. In July the OSPCA seized 71 animals from an animal rescue. The organization killed one of the rescue's personal dogs without so much as a phone call. The rescue appealed the seizure to the Animal Care Review Board, which oversees complaints made about the OSPCA. In early September the OSPCA presented its case and the proceedings were put on hold until the beginning of October, when the rescue will have the opportunity to present its case. Last week the OSPCA sent a registered letter to the rescue demanding over $100 000 in fees, as well as notice that if the money was not paid within five days the remaining 70 dogs could be, "disposed of". It was nothing short of a ransom note. That deadline has come, the rescue has not even presented its case yet, and as this government continues to allow the OSPCA to operate in secrecy, it is unknown if these dogs are even still alive. Surely you now see how serious this situation is? Instances such as this are countless, and unfortunately continue to occur on this government's watch. Mr. Naqvi in response to the above mentioned case your spokesperson stated the OSPCA is, "an independent organization authorized to enforce animal welfare laws". This is unacceptable. Your government, one I helped elect, gives millions to this, "independent organization". Your Ministry is directly in charge of overseeing the OSPCA. 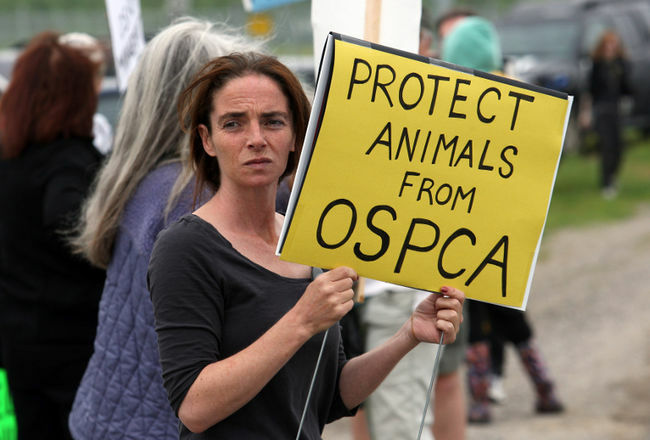 Ontarians are tired of the government passing the buck when it comes to the OSPCA. We are done with words and empty promises. It is now time for action. In my last email I expressed hope my concerns were taken seriously. As three years later the OSPCA remains unchecked by the provincial government, it is obvious they were not. Today I want to know what the two of you intend to do with regard to the OSPCA. What exactly will you do to stop innocent animals from dying, to stop the bullying and extortion of innocent Ontarians, to stop the lies and deceit at the OSPCA? Ontarians do not have time to wait, they have waited long enough. Most importantly countless innocent lives, who can not speak for themselves, do not have time. They are dying. Since the OSPCA has proven it has no intention of changing its ways, it is up to the government of Ontario to finally step up and act in the best interests of Ontario's animals. I look forward to responses from both of you.